Even if you're not hacking your way through the Images And Words songbook, The Dreamscape is still a super-cool one-stop box for modulation. Rock-solid build and tonal versatility. Not a true multi-FX unit; price. When you're a shred-Maharishi without terrestrial equal, with a mind that's an instantly accessible compendium of esoteric music theory, you're going to be at the very least particular about your tone. Take John Petrucci: the Dream Theater guitarist has long since ascended the snow-capped mountains of musical omniscience, yet The Dreamscape is the first time he's put his name to a pedal. Not only that, this chorus, flanger and vibrato pedal in one palm-sized chassis is also the first signature pedal that TC Electronic has made. "There's something elemental about the Chorus 1 setting; like dropping a frozen pea into a millpond, it has natural shimmer." Don't be fooled: The Dreamscape is not a multi-effects unit per se. There are no patches combining all three modulation effects. Instead, there's a seven-way effect selector that enables you to choose between Petrucci's six custom-configured TonePrints, two distinct characters for the chorus, flanger and vibrato. Wait, what's all this TonePrint business, you ask? Well, rolled out at NAMM 2011, the TonePrints are downloadable custom tones, created by the likes of Joe Perry and Steve Morse, bringing some signature tone flavour to TC Electronic's line-in stompboxes. Not only does this pedal house Petrucci's six TonePrints, you can download any of the other chorus TonePrints from TC for free. Like all great signature gear, TheDreamscape makes Petrucci's tones accessible to all but, crucially, there's still plenty of room to experiment with what is an incredibly versatile and musical pedal. Petrucci's TonePrints are set up for clean and crunch, but there's no rule to say that his subtle flanger sweep isn't going to work for you when you're fingerpicking your sus2 chord of choice. Besides, the three-way Bright/Neutral/Dark switch is a nifty option to control how bold you want the pedal to be. The rest of the controls on The Dreamscape are as you would expect: three pots each adjust level, depth and speed. 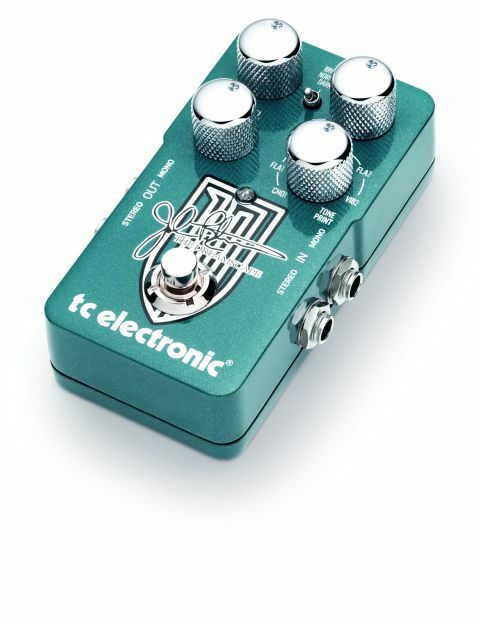 Petrucci's chorus is based on TC Electronic's TriChorus. The effect is that bit subtler, and there's something elemental about the Chorus 1 setting; like dropping a frozen pea into a millpond, it has natural shimmer, adding depth to glassy-clean arpeggios. Chorus 2 was inspired by Alex Lifeson of Rush, and keeps it real. It thickens the signal without rendering it over-processed mush. With modulation, you can really warp your tone - The Dreamscape's restraint is a huge plus. The flange has a great degree of subtlety, too, with Flanger 1 great for adding hot swirl to your cleans, and Flanger 2 a clear tone-grab by Petrucci for Eddie Van Halen's slow-but-deep Unchained rhythm tone - reggae players and Pantera fans alike can both get joy from The Dreamscape. Petrucci prefers a wide vibrato with a low speed for a slightly disorientating Leslie effect, perfect for creepy chords but also bob-on for a singlecoil psychedelic strum without forking out for a 1969 Fender Vibratone. At 200 quid The Dreamscape is not cheap but it has all the pro-quality build and tone you'd expect from TC.